In a brand new interview with the Calgary Herald, KISS bassist/vocalist Gene Simmons was asked if ex-KISS guitarist Ace Frehley's recent collaboration with Paul Stanley means there's a hope of another reunion of the band's original lineup. "No, that means nothing," he responded. "We've tried that. Ace and Peter [Criss, original KISS drummer] came into the band and were thrown out three different times because of drugs and alcohol. I mean, how many strikes do you want? And to new fans, it means nothing. When you go see AC/DC, do you think anybody stands up and says, 'Where's Bon Scott?'" After the interviewer pointed out to Gene that AC/DC fans now say "Where's Brian Johnson?" because Axl Rose is fronting the legendary rock band on the remaining dates of its "Rock Or Bust" tour, Simmons quickly shot back: "It doesn't matter. The team has got to be bigger than any member in it, and that includes Paul and myself. I would like nothing more than on the day that we finally play our last concert that four new, deserving, young men are going to be stepping up and wearing the crown… But doing it justice, not going through the motions. They'll know the songs, they'll keep the personas, the personalities alive, and continue on. Why not?" 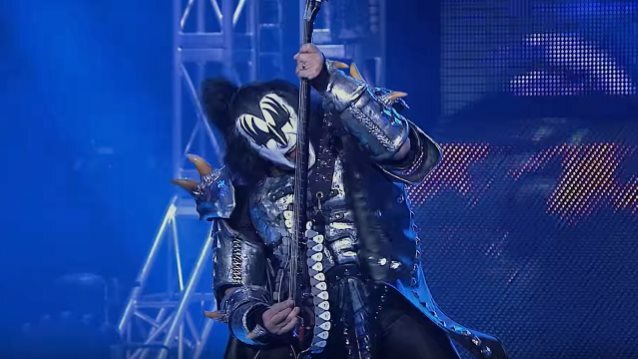 Stanley recently dashed fans' that his renewed friendship with Ace opened the door for a possibility of Frehley one day returning to KISS, even if it's just for a limited number of live shows. He told the "Phone Booth Fighting" podcast: "I don't see it. And, to me, that makes it even better. The fact that you can have people in your life, and maybe who they are and what they are in your life changes over time. Because I'm happy to see Ace and would love to see him… We text. He was on the radio last week, and I texted him, 'I'm listening.' It doesn't need to go further than that, but the fact that it's there is a terrific thing. Reading into it, and where's it gonna lead, and maybe…? There is none of that. There is just the joy and satisfaction in reconnecting — in a different way, perhaps. But it doesn't negate our differences, and that's okay. You can have people in your life. There are things we don't agree about and never will, [and] that's okay. Maybe it goes back to what I said earlier: the best relationships understand the limitations of the relationships." Frehley left KISS after the band's 2002 "Farewell Tour" dates, saying afterwards that he took the word "farewell" seriously.